14x12 wired worker based foundation, 10 sheets per pack. Our beeswax foundation is made from a blend of English and African wax and is equal to any premium beewax foundation on the market. 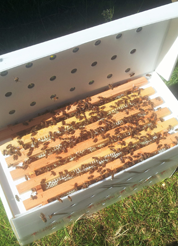 Our suppliers have been making foundation for many many years are known for their quality, a quality that your bees will love.